It goes without saying—although it’s constantly said—that Tokyo is a dense and sprawling city. This is obvious in its big moments, like squeezing through the jam-packed streets of Kabukicho, but you see it in the smaller details, too. When I first moved to Tokyo, I was amazed when an elevator would open and I’d find myself stepping out not into a hallway, but into the restaurant itself. While these incidental moments barely figure into the big picture, they’re a reminder of just how much space is at a scarcity in a city of over 13 million and growing. 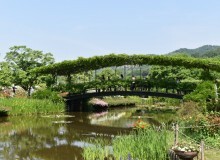 But another of Tokyo’s remarkable attributes is that it’s not hard to skip the city and get back to nature. Serene Mt. Takao is only 30 km west, scenic Nikko is only a couple of hours to the north, and a mere hour down the coast is my own favorite refuge from Tokyo: Enoshima. Enoshima is technically part of the mainland city of Fujisawa, but maintains an identity all its own. Approaching it via the Bentenbashi Bridge, it sits cradled in Sagami Bay like something from a storybook, and no less beautiful than its depiction in Hokusai’s famous woodblock. It’s a small island, but packed full of enough must-see spots to make Enoshima a day trip all its own. 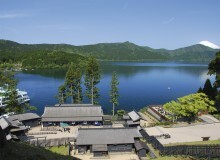 Shrines, restaurants, caves, souvenir shops and even a multi-tiered onsen and spa, are all packed onto an island less than half a square kilometre. If you’re counting your coins, the ¥1970 Enopass covers round-trip travel from Shinjuku on the Odakyu line as well as access to the island’s escalator system (stairs are so 2016), Sea Candle observatory (which boasts solid views of Mt. Fuji on clear days), Samuel Cocking Garden, and the must-see Enoshima Iwaya caves. 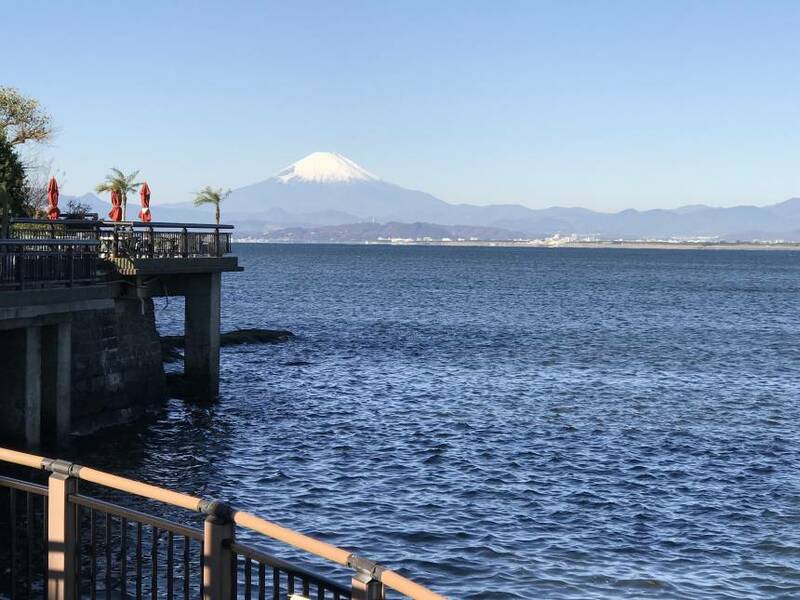 It also entitles you to discounts at the Enoshima Aquarium, Enoshima Island Spa, Enoshima Shrine and a handful of the island’s gift shops and restaurants. It’s a good deal for big-ticket beauty with a supernatural backstory. According to folklore, Benzaiten, the goddess of music and entertainment, came down from heaven to vanquish a five-headed dragon who’d been running amok along the Shonan Coast. Defeat left the dragon smitten with Benzaiten and so he proposed, though she refused to marry such a troublemaker—even one who could appreciate a strong woman. Instead, she decided to make the beautiful coast her permanent bachelorette pad, and raised Enoshima from the ocean to serve as her home. A note: some versions of the tale end with Benzaiten giving in to his request, but, well … that’s way less interesting. Whatever she decided, visitors can find three main shrines across the island dedicated to her honor: Hetsunomiya, Nakatsunomiya and Okutsunomiya. If you make a wish at the first, then continue on in pilgrimage to the remaining two; some say that your wish will be granted. You’ll also get knockout calves, as there’s plenty of steps along the way. Once atop the island, there’s plenty more to see. Samuel Cocking Garden, eponymously named for the British merchant who bought a small parcel of land atop Enoshima during the Meiji Period, isn’t just made for warmer weather. Though the original greenhouse that once stood there has long since burned down, flower boxes are flush with seasonal arrangements such as winter tulips. Only steps from the garden is LON Cafe. Not only does its recently renovated patio boast picturesque views of Sagami Bay, but the sweet spot is locally-known for its delicious French toast (available as part of a drink set for ¥1,000). 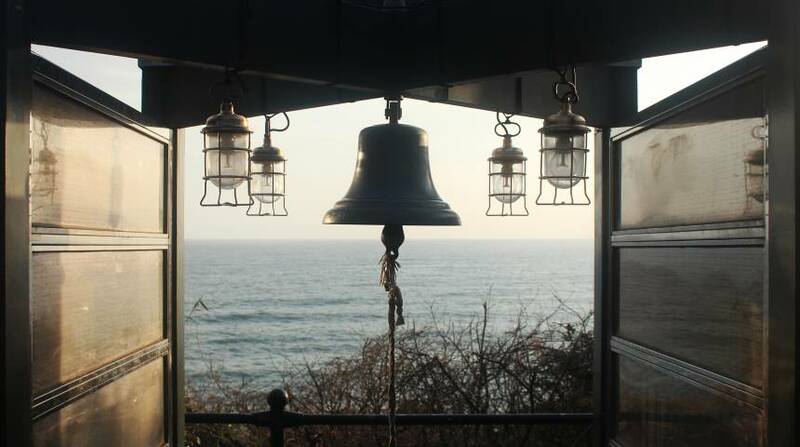 If you’ve come to the island with your significant other, you might want to pay a visit to Ryuren no Kane, the “love bell” of Enoshima’s aforementioned Casanova dragon. Couples who ring the bell together while wishing for romantic bliss will be happily rewarded. But be warned: this bell is loud. If you have any declarations of love yet unsaid, best get them out of the way before you pull the bell rope and go momentarily deaf. The tip-top of Enoshima is 60 meters above the island’s summit. 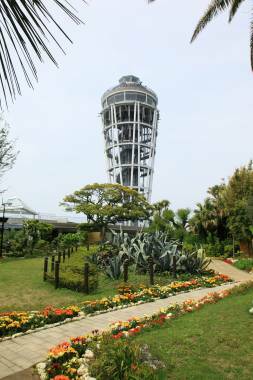 For ¥500 (¥250 for children, or free if you opted for the Enopass mentioned above), visitors can take an elevator to one of two observation decks at the Sea Candle, one outdoors and one indoors. 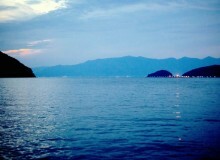 Bring your camera: both offer beautiful views of the Shonan Coast and, if the weather’s in your favour, Mt. Fuji. Once you’ve enjoyed the heights, head back down (way down) to of the island’s hidden treasures: the magnificent Iwaya Caves, whose tunnels burrow deep beneath the island. On your way there, you’ll pass long rock ledges busy on warm days with sunbathers and fishermen. The views are spectacular (especially at sunset), but make sure you keep going. At the end of the winding wooden passageway, you’ll enter the Iwaya Caves, renowned as a supernatural “power spot” and an ancient site of religious training. Tall folks may need to stoop to avoid some low ceilings, but it’s well worth it. 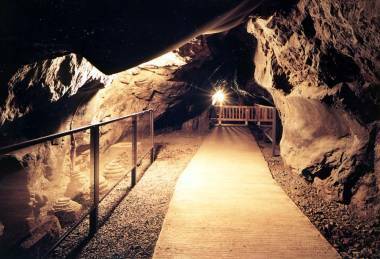 They’re spectacular—especially in winter, when fairy lights are strung throughout the cave’s rocky ceilings. As a trip to Enoshima isn’t light on cardio, you’ll likely work up an appetite. Fortunately, there are plenty of opportunities for snacks along the way, including an always-busy takosenbei stand. If that won’t be enough, there are plenty of more substantial options, too. Most of Enoshima’s restaurants are found in close vicinity of Nakamise Street (including a recently opened Hello Kitty cafe, if that’s your thing) or on Oiwayamichi, a path on the far side of the island near the Iwaya Caves. If your hunger can wait, the latter offers much better views. During our visit, we stopped at Enoshimatei, which serves delicious set meals of tempura, sashimi and shirasudon (multitudes of tiny sardines served over rice, and one of Enoshima’s local delicacies). 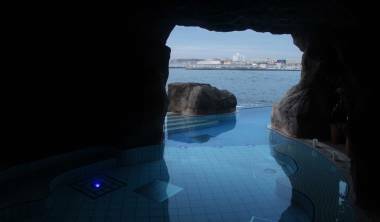 If you’re uninked (they have a strictly enforced “no tattoo” policy), round out your visit at Enoshima Island Spa. This modern onsen has over 15 pools (both gender-separated and co-ed), including open-air tubs with great views of Fuji-san. The extravagantly named Sunlight Spring Pool featured a first for me: something called the Water Pearl Show, which allows bathers to paddle around underneath a nifty mix of lights, music, and sprinkling jets of water that look like tiny glistening pearls. It feels like something between a pool and a planetarium. There’s also a seriously refreshing coffee soft serve for sale on your way out. Walking back towards the twinkling lights of Fujisawa across Bentenbashi, I felt refreshed, exhausted, and completely satisfied—and a world away from Tokyo. Scenic and rich with history, Enoshima is a must-see destination that lives up to its myth.